band. Some of their old bands are Olympos Mons, The Addication and HumanGod. powerful "Mysterious & Victorious" with a catchy chorus and all the needed power metal elements are at their right places from start to finish. Start headbanging! Singer Ian E. Highhill has a very traditional power metal vocalist sound and sings the high parts with ease. Guitarist Hank J. Newman creates an intriguing world to all the songs, he's a classy guitarist with the perfect vision to creating a stylish melodic power metal atmosphere. His playing also has touches of the 80's heavy metal. The rest of the band, Dr. K. Lundell (bass), Arnold Hackman (drums) and Thomas Henry (keyboards) also do a great job. Henry occasionally brings a classic rock touch to the songs, something along the lines of Deep Purple, but also neoclassical style. Some of the names that come to mind from Astralion's music are Helloween, Blind Guardian and Edguy, even Freedom Call and Stratovarius on their upbeat, more cheery moments. There's the right twists and turns and the dramatic and somewhat playful feel. 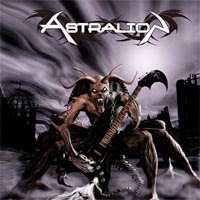 Astralion's music should attract especially German fans, but also fans of the whole power metal genre. Everything sounds big and the backing vocals are mighty as well. These guys aren't leaving anything to chance. The album has a powerful ballad as well; "To Isolde", which is a very traditional power metal ballad with of course a catchy chorus. The debut ending track "Last Man On Deck" is a gigantic thirteen minute song that speeds up at the middle part and sooner than you think the song has reached the end. If a band makes an epic song work in a way that doesn't knock out the listener out of boredom, you'll know they master the fine art of song writing. This album is a good example of how good power metal should be made. Astralion has also released videos of the songs "At the Edge of the World" and "We All Made Metal", which visualize and capture the band and the atmosphere of this album well. FOREIGNER: "The Best Of Foreigner 4 & More"
Rebecca LAPPA: "Ode To Tennyson"
WITHIN TEMPTATION: "Let Us Burn - Live"
AXENSTAR: "Where Dreams Are Forgotten"
HEART (& Friends): "Home For The Holidays"
Dennis DEYOUNG Styx: "Live In Los Angeles"
PAIN OF SALVATION : "Falling Home"
SIN 7 SINS : "Purgatory Princess"